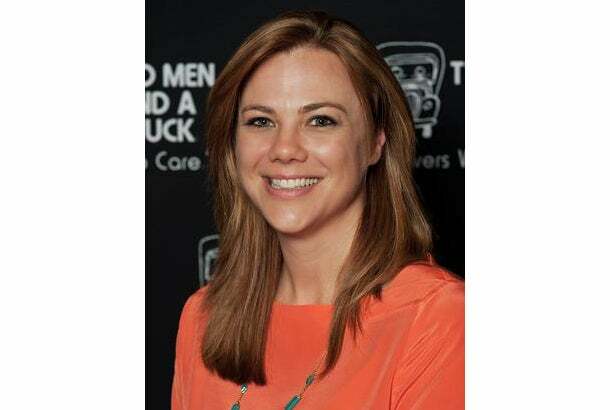 Brooke Wilson loves Two Men and a Truck for many reasons, including the family atmosphere, its position as a woman-founded company in a male-dominated industry and the fact that her role as franchisee allows her to flex her entrepreneurial muscles. However, unlike many franchisees, Wilson was able to get to know the brand intimately before signing a franchise agreement, as a former customer service representative for the company. Here's why she thinks that employees are prime candidates to becoming franchisees themselves. I became a Two Men and a Truck franchisee in 2004. At the time, my husband Les and I were in our early twenties and were working for Two Men and a Truck. I was working as a customer service representative and Les working out in the field as a mover. We fell in love with brand as employees and decided to go “all-in,” buying in as co-owners in 2004. Over the last decade, Les and I have successfully developed a multi-unit network of seven locations along the eastern seaboard that serves territories from Atlanta to Baltimore. In fact, we have grown our network of locations, a network we have named “Team Wilson,” to one of the largest in the Two Men and a Truck system. Our Team Wilson Two Men and a Truck locations generated more than $12.3 million in sales in 2014 (representing 37 percent growth) and allowed our network to establish Team Wilson as the highest average revenue multi-unit franchisee per location. We expect to maintain this growth in 2015 as we are projected to top $15 million in sales and raise our customer referral rating from 96 percent to 97 percent! Les and I truly fell in love with Two Men and a Truck and the franchise business model in our early 20s when we were working as employees. Our experience as employees has proven to be quite valuable, as we were already well aware of the Two Men and a Truck’s value systems and proven processes. Also, as young entrepreneurs, it made sense for us to buy into a proven franchise model who would help mitigate the business ownership risk and help us access financing options. At the time when I was considering Two Men and a Truck as a franchise ownership option, I was a recent college grad who was seeking a career in advertising or public relations. I took a temporary job as a customer service representative during Two Men and a Truck’s peak season and the rest is history. I completely fell in love with the brand and it didn’t take long for me and Les to commit to the company as franchise owners. This turned out to be the perfect situation for me as I know today that I was born with an entrepreneurial mindset. I was born and raised in a family that valued work ethic and encouraged a drive to exceed mediocrity. My mom always taught me that "you're always on a stage," as you never know who you will meet and how it will impact your professional career. I think an entrepreneurial mindset, something you need to run a franchise effectively, is defined as one who pushes boundaries and commits to never settling for comfort. Entrepreneurs are people who drive business success (whether their own business, or as an impactful employee of a business). Entrepreneurs can be encountered at all levels of staffing. For example, as a bartender in college, I helped physically build a new watering hole in Columbia, S.C. I assisted beyond my defined job duties as a bartender, in innovating inventory and management processes. All business organizations should recognize strong players that exceed their job functions and encourage these individuals by recognizing their efforts and promoting their strengths. These people may offer opportunities for growth and expansion of a business. True entrepreneurs will encourage the entrepreneurial spirit of others, and in doing so they will encourage the success of their own business. This is something we do every day as Two Men and a Truck franchise owners and it has been key to our success. The family atmosphere was key for us as a husband and wife team looking for business ownership opportunities. Even as employees, Two Men and a Truck representatives and executives at all levels were incredibly open and welcoming to us. Two Men and a Truck was founded by a mother, Mary Ellen Sheets, who has grown a small moving business started by her two sons, Brig and Jon Sorber, into an international corporation with more than 1,900 trucks and 300 locations worldwide. Her daughter, Melanie Bergeron, was serving Two Men and a Truck as the company’s President at the time we bought in. In the years since, she has become the company’s chairman and has recently been named as the International Franchise Association’s chair - just the third woman to be named to the position. I love the fact that the franchise company I represent is a family-based business driven by two amazing women in a traditionally male-dominated industry! I would estimate we spent around $200,000 before we opened for business. It’s the best investment we’ve ever made! My industry training came from working within the franchise prior to becoming a franchisee. However, my mother has always been a mentor for me. She was very successful in the banking world (another male dominated industry - especially in her earlier years) before retiring in April 2014. As a driven female with years of business experience, she has offered invaluable guidance - and sometimes just an open ear - throughout my path. I am also ALWAYS seeking ways to train myself to think and act differently as an entrepreneur. I have pulled good and bad from all my work experience history (both as an employee and a business owner). Things that I have seen work well when I was managed have been adopted into how I approach those things as a business owner. Similarly, I have rejected things that rubbed staff the wrong way and negatively impacted the employee culture. I think that experience on both sides of the fence have helped me to become a better business manager. Our people are our backbone - without a positive employee culture, a business will not succeed. From a technical standpoint, I have personally taken a lot of private courses to better educate myself on HR and Finance. As an art student in college, a lot of management skills came naturally, but I had little formal education in business. To pursue business ownership, and take the operation to another level - I had to learn these things. I also had to be honest about my strengths and weakness and be sure to surround myself with excellent support staff with quality experience who can handle tasks and assignments that don’t fit my personal skill set. It’s always hard to find the balance of employee management while encouraging a positive business culture. We've all had bad bosses in our past, and claimed, "I'll never be like that." I've learned from those experiences, but I also recognize the importance of accountability. Finding an appropriate balance to ensure your staff feels valued, respected, and enjoys coming to work - while not being too "soft" by allowing the staff to run the business. Another tough challenge was finding an effective balance between my personal and professional life, especially since I work with my husband. Making time is key. You'll never "find" the time. Les and I make time for mini-vacations and personal time together WITHOUT work. We have surrounded ourselves with committed and capable support staff, and have accepted the fact that anything requiring our attention will wait until we get back. Our personal quality time is as important to the success of our business. If we don't commit to a strong personal relationship away from work, we will have a professional breakdown in work. Mini-vacations can include road trips, staycations, or spa days. It's important to "get-away" from the pressure of work. In addition, we take long family vacations - we just consider work and peak season before scheduling time away. Our first year in business together was awful! We lived and breathed work. I felt like I didn't have a marriage, but rather was a roommate with my business partner. Defining boundaries, leaving work at work, and committing to personal relationship as passionately as our professional business has turned things around. Pursuing a business endeavor with Les is rewarding now. We balance each other well, and each contribute to our business success in different ways. We share a common vision or goal for the business, and motivate each other and our team in varying ways. We share in the financial rewards and independence that business ownership offers, and have more freedoms as a result. Go for it! There are a ton of options out there. Find something that you love, and talk to franchise brands that align with that. Be sure to only pursue it if the business has a proven ROI. And, spend time talking with and shadowing current franchisees within the system before opening. Get the inside scoop from those who live the life before committing yourself! Growth! I'm young and I love the challenge. We've worked to develop a management team, so we can better control expansion (either within our current brand or external with other brands). I'd also love to mentor. I think it would be fun to build relationships with other like-minded professionals. It would be very rewarding to help them achieve their goals and succeed.